The new chat-watch system will automatically mute chat between you and your friends, IN PRIVATE CHAT, that is deemed offensive. 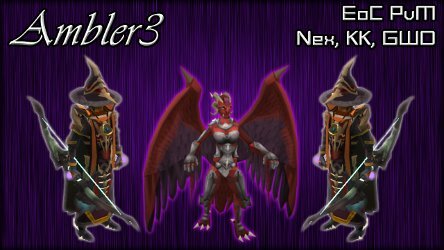 See the above reddit link for a link to the whole post by Mod Lyon. Edited by Kimberly, 11 June 2013 - 06:12 AM. Wonder how long it will take me to get slapped with one. Have to use skype or facebook or something then. Most people already do, no big deal. Completely moronic. As it has been pointed out, if swearing is an issue, swears should be censored instead of banned. I can see censor evasion as a muteable offense. But if I wanna say [bleep], and the game doesn't want me to, just censor it. Like here: I swear, it gets censored. I evade the censor, there be an issue. I think they want to make it more 'kid friendly', and they can't control whether or not kids have the filter active or input their correct age. That doesn't explain however why they can't just enforce the censor. This. If a word is bad to say in the game, censor the damn thing. My philosophy to swearing in RS is that I spell it correctly, and if the game doesn't like it then it censors it. I don't know about you, but I'd like to be able to talk to my friends without having to worry about saying something that happens to be on a list that doesn't officially exist. I don't have the filter on and still manage to trigger the damn thing from time to time. If doing that is going to net me a mute, I might have to rethink using the game to chat at all. If you're going to have the ability to censor/un-censor swearing then you will have to deal with the fact that kids, that are underage and young, will un-censor because it makes them "cool." If you don't want that then revert back to the completely censored swears. Is it really that complicated? Huh...I don't know how I feel about it. Like a poster said earlier the words should be censored. What's the point now? Is it meant to get people muted now, instead of censoring the word? Seems as though this is a...issue that is simple and can be fixed easily, but instead they add something that doesn't make sense to fix it. EDIT: In light to two posters above me just posted...no big deal now. I feel like perhaps this is being blown out of proportion due to lack of context. They do say this won't be 'light swearing' that you get muted for, it'll be seriously offensive terms. So I'd assume racist, homophobic, sexist type terminology and a few of the bigger swear words that even the desensitised can take offence too. I'm not too fussed with this, shouldn't effect me or the game negatively. I know some people say the chat-watch thing is busted as they trip it all the time - but I wonder WHAT they are actually saying to trip it. I've never tripped it and no-one I know in friends or clan has tripped it by accident. I mean yeah ultimately it probably won't be a big deal but the fact that they feel it is perfectly acceptable to just rescind this liberty even within the private realms of our RS lives is a pretty big issue I think. I know it's their game and they have every right to do whatever they want with it but it shouldn't be the case that they abuse that right by imposing unjust rules on a whim. In other news, does anybody know how long the mute will last if one is automuted? Player one: I died at <boss>, can you bless me please? Jagex:You have received a mute, sorry, we can't let you use your friends for help retrieving items. probably the same as a pmod mute initially. Then more/less when an actual Jmod reviews it. 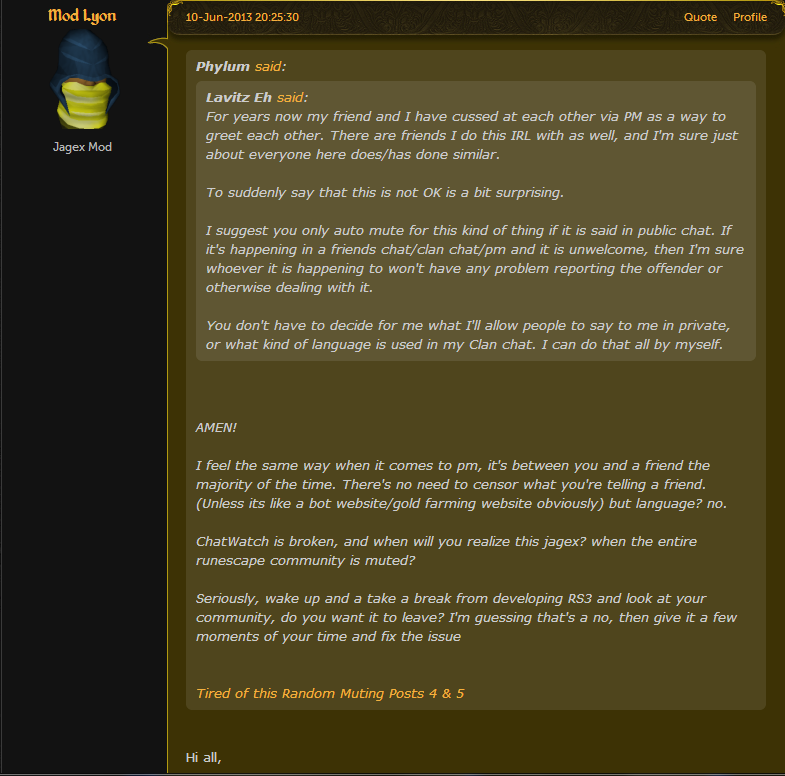 The issue I have with this is that it's none of jagex's business what's being said in PMs/Friends Chat/Clan Chat. All moderation should be done internally by the parties involved. If you have a problem with someone sending you offensive messages, there's systems setup so you can stop it. 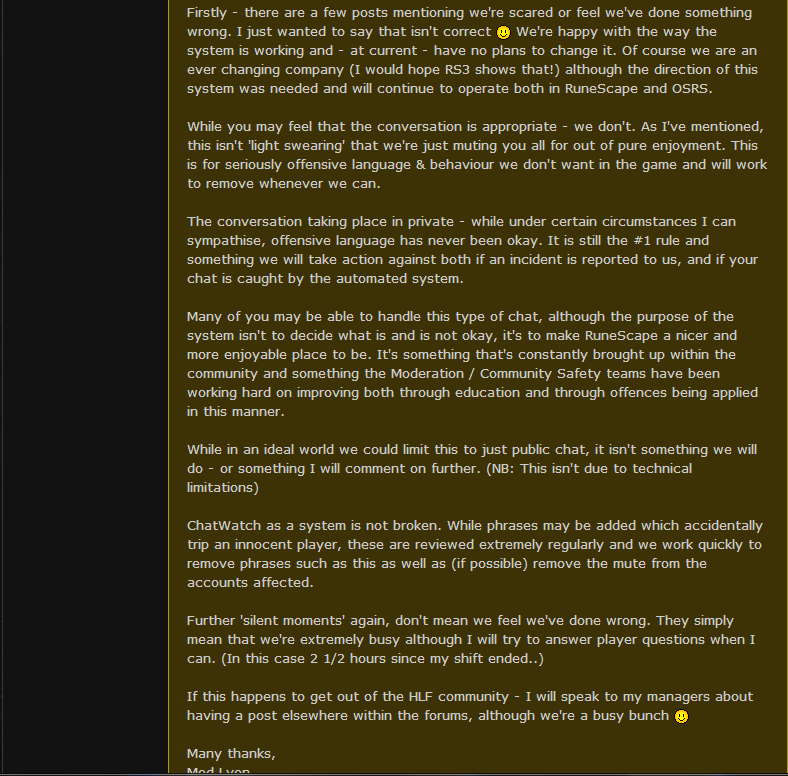 If something offensive is being said in a clan chat, it's the clan leaders responsibility to decide whether that's something they want said in their clan, not jagex's. I wouldn't say they are 'rescinding liberties' or that the rule is 'unjust' nor that it is being done on a whim. This rule has always existed, the fact we got away with it was only a testament to their inability to monitor us properly and the fact we do it just means we have all been mildly breaking/bending rules for all these years. They are just applying new technology to properly enforce a rule that was always in place and like I mentioned before, they did say it's not gonna be for mild swearing - it's going to be for seriously offensive language. Happened to me couple of days ago. Was just talking to a friend over PM about various things. The next day I log in, lolrip, muted. But this is getting absolutely ridiculous. Mutes flying all over the place for the stupidest reasons (or no reason, really). Jagex needs to calm the [bleep] down.